Ink remover to treat ink stains on fabrics and many other surfaces. Effective on a wide number of pen inks including ballpoint ink, fountain pen ink and marker pen ink as well as many other common household stains. 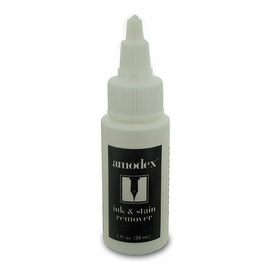 Amodex Ink Remover is non-toxic and removes inks & stains from fabrics and other surfaces. Amodex removes tough stains including inks, food stains and more from most fabrics, materials and surfaces.